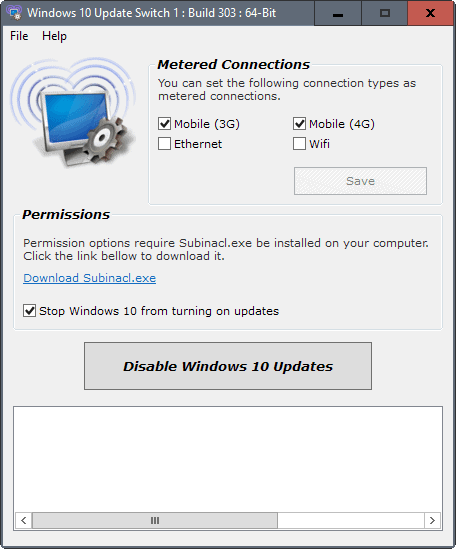 Windows 10 Update Switch is a free portable program for Windows 10 devices designed to set any network connection to metered to block the automatic download of Windows updates on the machine. Microsoft is determined to push Windows updates to all Windows 10 machines. While there are some options that you have to block updates or delay them, those require usually some Registry hacking or Group Policy access. Especially Windows 10 Home users face challenges in this regard due to the Group Policy Editor not being part of the operating system. Home users cannot defer updates on top of that. Defer does not block updates completely, but it gives you about four months in which feature updates -- think Anniversary Update or the upcoming Creators Update -- are not installed. Even disabling the Windows Updates service is not reliable anymore, as the operating system may turn the service back on eventually. Windows 10 Update Switch is a portable program that ships with two options to tame Windows Update on any Windows 10 machine. The first toggles the Windows Update service. While this turns off updates for some time, it won't block updates from being deployed indefinitely on the PC. That's where the program's second option comes into play: setting any connection to metered. Setting a connection to metered has a number of effects. It tells Windows that bandwidth is expensive, either because of a quota, because you pay per Megabyte or Gigabyte transferred, or because your Internet connection is slow and bandwidth may be required for tasks with a greater priority. Effects include disabling the automatic download of Windows updates and Store app updates. It will also disable peer to peer uploading of updates, block tiles from being updated, and may impact certain programs or apps on the PC. Anyway, setting a connection to metered will block updates efficiently. Problem is, Microsoft only made this option available for Wi-Fi and Mobile connections, but not for your Ethernet connection. So, if your Windows 10 device connects to the Internet through an Ethernet cable, then you cannot benefit from the advantages of metered connections. Note: Windows 10 Update Switch supports setting the Ethernet (and Wi-Fi) connection as metered. It requires Microsoft's Subinacl program for that though. It links to the tool from its interface, and requires that it is installed on the system to modify the preferences in the Registry. You can download Subinacl from here. Once that is out of the way, you can check the Ethernet box in Windows 10 Update Switch to set the Ethernet connection to metered. Second Note: This did not work on one PC I ran the program on even though Subinacl was installed. If you run into the same issue, use Winaero Tweaker instead for the procedure, as it supports it as well. 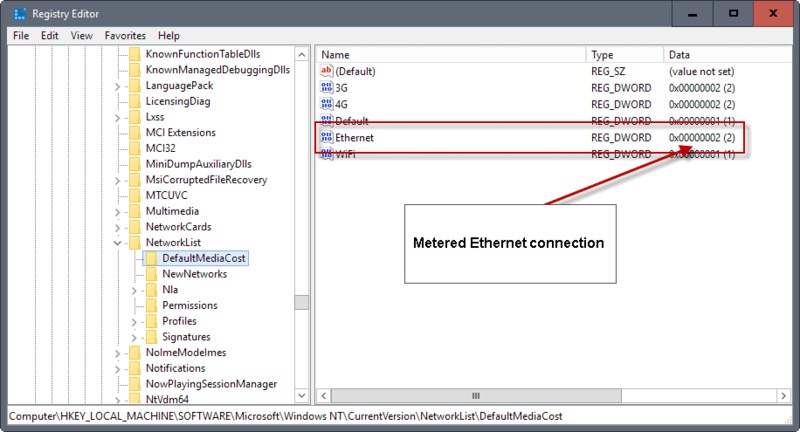 You find the option under Network > Set Ethernet as Metered Connection in the application. You may ask yourself what the programs do in the background. All they do is change the data of a Registry value. Tap on the Windows-key, type Regedit.exe and hit the Enter-key. There you find listed Ethernet among other network connections. Changing any Registry value, e.g. Ethernet, there to 2 sets the connection to metered while 1 means it is unmetered. The main issue is that you cannot just change data there as you don't have sufficient permissions to do so. You need a program that lets you take ownership of the Registry key. You may use RegOwnershipEx for that, or any other program that lets you do so. Windows 10 Update Switch is a handy portable application to toggle Windows Update, and to set any connection to metered or unmetered. The program relies on a third-party tool that you need to install though, and you may run into the same issues that I ran into because of that. Now You: How is Windows Update configured on your PC? ‘Windows Update MiniTool’ is a very fine little tool to handle updates in classic way. Oh, this is what I want. This looks great. But will it help me with Microsoft’s new “update packs” that don’t disclose what they do? I have a permanent block on a Windows 10 Home machine, for compatibility with an expensive program. When I remember, or check tomorrow, I’ll post here what I used. Checked, and it is GWX Control Panel Monitor. This means I can stay on Windows 10 version 1511. Problem with setting to a metered connection, is that your mail program won’t function as normal. They too see that it’s a metered connection and ask each time if they may check for mail regularly. to be honest don’t know if all mail programs behave like this, but the few i’ve checked did it. @ hirobo ……. Most likely, M$ hv re-enabled those settings or any other changed settings in Win 10 with the AllowExperimentation(AE) setting in Windows Registry during a mandatory auto-update. ……. The default AE setting in Win 10 allows M$ to reset configuration settings. If M$ wish to, they can also reset the AE setting to allow M$ to conduct experiments remotely on any targeted Win 10 cptr thru a mandatory auto-update. Only Win 10 Pro & Ent users who hv subscribed to M$-Intune can fully disable AE via Configuration Setting Policy(CSP). M$-Intune is meant for a business to manage their employees’ Win 10 devices, eg smartphones n work-station cptrs = costs US$6 per user per month. ……. Nevertheless, in certain isolated cases, M$ can still re-enable a disabled AE setting thru a targeted mandatory auto-update = will likely cause M$ to lose the M$-Intune subscription revenue. So, it may be better to also change the AE setting in Windows Registry after disabling Windows Update. It definitely confirms the golden rule: if you have too much time and no clue what to do with it, instaling new M$ system not only fills this time but creates many new unexpected troubles. Hilarious the number of solutions being created simply to stop your OS from updating. I know a better one, DON”T USE IT. That’s a retarded response. You apparently can’t understand that some people do important things with their computers – things that can’t be done as well on Mac or Linux. @ Dave ……. DON’T USE WIN10. … FYI, u can still use Win 7 which is good until 2020 or Win 8.1 which is good until 2023. .. n even beyond that, eg Win XP r still being used quite safely. ……. Hopefully, by 2023, a better OS/company will replace Win 10/M$. My laptop came with a licensed version of win 10. I am forced to use this &&it. This is a good way to ensure that the pc is not patched, so malware like the ransomware WannaCry / WannaCrypt can infect, encrypt data and jump to other machines.